For over 20 years we have delighted children and their families with storytimes, theatre performances and book giveaways. A large part of our work is supported by grants, but that’s not enough. We can only continue this work because of your end-of-year donations. YOU can make a real difference in a child’s life!!! According to the National Association for the Education of Young Children, by 3 years of age, there is a 30 million word gap between children from the wealthiest and poorest families. Reading stories to children and discussing the ideas and feelings in them builds vocabulary and intellectual concepts that create the foundation for success in school and in life. Research shows that children who participate in quality reading programs demonstrate earlier development of language, literacy, and mathematical skills regardless of ethnic or socio-economic background. Studies also prove that children who have rich and varied language experiences, especially if they are second language learners, have an easier time mastering reading and comprehending information. We work with children and their parents to help explore and nourish their potential so that they experience success in school and enjoy learning. The “Reading from the Start ” Campaign is working to make sure all children are prepared to become responsible and creative adults who will be instrumental in developing thriving communities. This is just one of the requests we have been receiving – your donation makes it possible to bring our program to schools who need it. 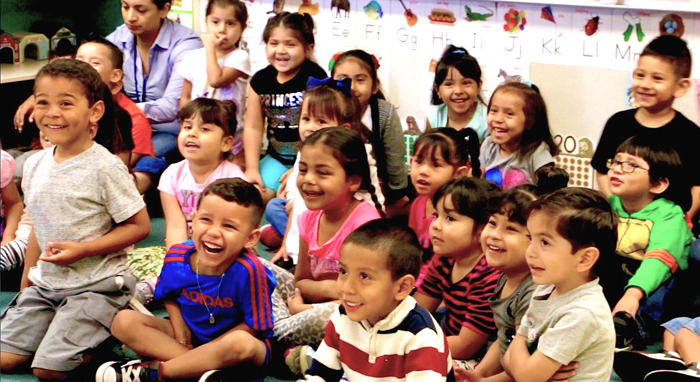 Right now you can contribute to our “Reading from the Start” campaign which will put quality picture books into the hands of children in at-risk communities throughout Los Angeles. ALL children have amazing potential and when we provide children with books and storytimes we give them a chance to thrive. Storytimes allow children to become active participants, emotionally and intellectually, in every story they hear. This motivates them to share their ideas and empathize with others. When children are given books to take home they are building their own library and creating the habit of daily home storytimes as well. Reading aloud cultivates lifelong literacy and communication skills that develop oral language, positive social interaction, comprehension and a love of reading.